The year is almost over. I haven’t had the best year, but in the perspective of the years that others have had, I guess it hasn’t been completely terrible. Christmas was good, it wasn’t the thing of legends, but when it was over I felt a bit warm and a bit fuzzy so I suppose it was all in all okay. Today I bought books. I’m excited for them. I’m reading them right now, well, I have been reading them and I will continue reading them as soon as I finish this absolute tripe that I try to pass off as a blog. I won’t say what I bought or give any of the judgments I have passed on them based on titles and covers, but I will give solid reviews as soon as I am done with them, which, I must say, should be soon. 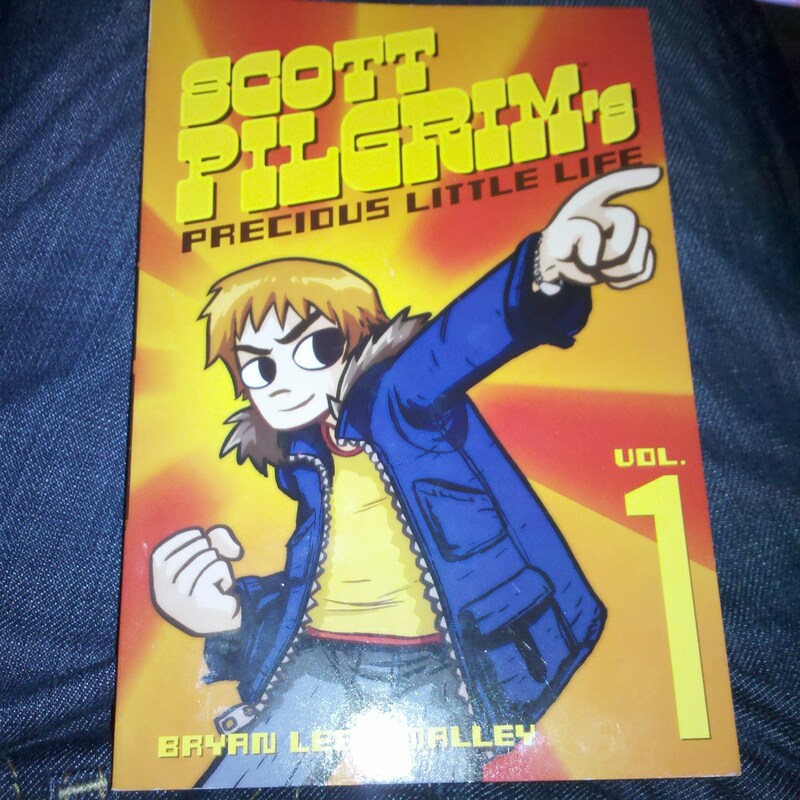 For now, I will tell you how I felt about Scott Pilgrim’s Precious Little Life. Scott Pilgrim Vol. 1 was excellent. A few weeks back I saw the movie, and I was excited when one of my most amazingly, awesome, and favorite friends got me the book for Christmas (I may have embellished just *how* awesome they are due to the feelings I had toward the gift). I’m pretty sure I let out an actual verbal squee when I unwrapped it. From the minute I opened and started reading, I realized that this was going to be exactly like the movie: quirky, odd, funny, fantastic, and seriously, it looked like they had just used the panels from the graphic novel for a storyboard. It was truly very good and I would highly recommend it to anyone who enjoyed the movie or who just enjoys their fun in the form of words and pictures on the yummy smelling pages of a book. In knitting news: I finished a project. I actually finished it a few days ago, but then life got busy with the whole Christmas thing and I forgot to say anything. 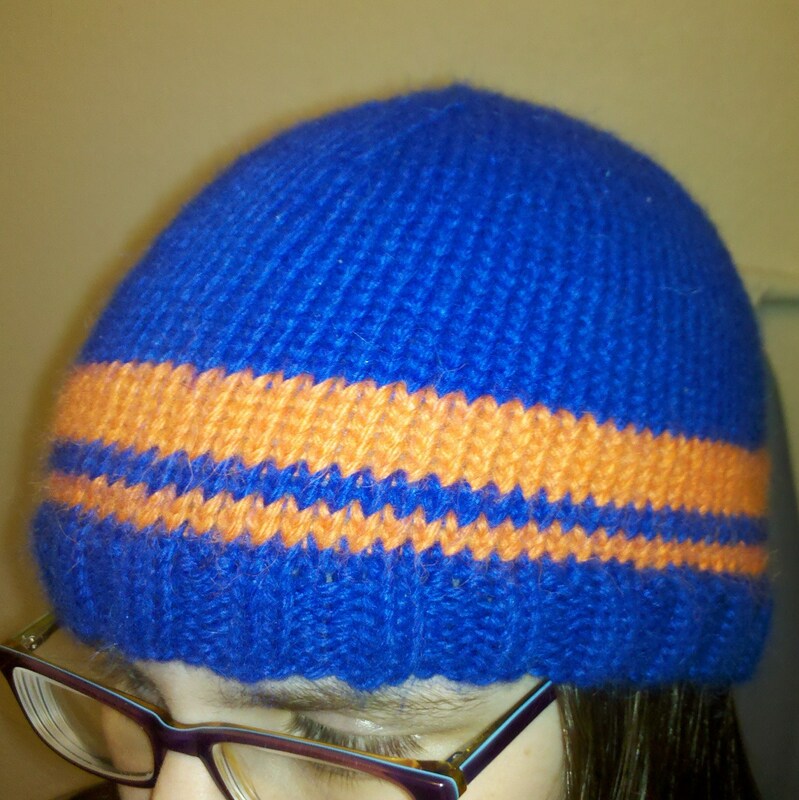 BSU hat is officially done. Friend said he liked it, but it’s really hard to say with these kinds of things. People will rarely tell you if they don’t like what you’ve made because, well, you put effort into something just for them and who wants to hurt feelings anyway? I’m going to go along with his story though. I like how it turned out and it is SO SOFT you guys. I won’t lie, if I hadn’t already told him it was his, it may have been mine instead. I’m happy to give a fellow BSU fan a bit of something to show off team pride though. Okay, that has to be it. I want to go read and tomorrow I have to get up early (yuck!). Happy day after Christmas everyone!